All dogs have an incredible sense of smell, but Bloodhounds were born to track. Their long, droopy ears and folds of loose, wrinkly skin around their neck enable these expert trackers to scoop up and trap a specific scent so they can follow it relentlessly, even if the trail has gone cold. Even the slits on the side of the dog’s nose provide extra time for exposure to smells, with a continuous stream of scent-filled air into the nostrils for up to 40 seconds or longer. Plus, each nostril can be moved independently of the other, making it easier to pinpoint where a specific smell is at based on which nostril picked up the scent. This is why a tracking dog will weave back and forth with his nose to the ground when following a trail. Once a Bloodhound has your scent, it’s almost impossible to throw him off your trail. So, how is a Bloodhound able to find a specific scent and follow it until he locates what he’s tracking? Read on! Humans have around 40,000 pieces of tiny flakes called rafts that are constantly shed from the skin. These rafts consist of skin cells, hormones, enzymes, fungus, bacteria, parasites and hygiene products. No skin rafts are identical, not even from identical twins, which means we all have our own unique scent that our canine friends can smell. Because some rafts are lighter than air, they are picked up and carried in air currents. Heavier rafts are dispersed around the ground and vegetation as we pass by. We also leave behind scents from our breath and sweat. In a way, we leave a sort of “scent cocktail” of individual smells that rush into the nasal cavity of a dog. 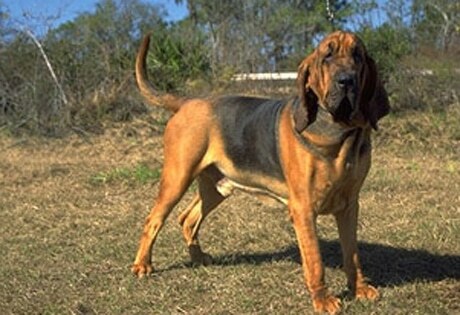 Bloodhounds can pick up a scent both in the air and on the ground. When a Bloodhound picks up and identifies an odor, an image of the scent is sent to his brain. Sniffing clothing or any other article touched by someone creates an image of that specific smell in a Bloodhound’s brain and is implanted in his brain as a scent photograph. To a tracking dog, a scent photo is more vivid to them than a photograph is to us. Once a Bloodhound has learned a certain scent he never forgets it and can follow it regardless of all of the other smells he may come across while on a trail. Powerful legs and a sturdy body give this exceptional hound the ability to track a scent over even brutal terrains when necessary. This super detective dog has been known to follow his nose for 130 miles or more in pursuit of his quarry, and he can pick up a cold trail that’s almost two weeks old. The exact origin of the Bloodhound is unknown. Many experts say this dog was well known in Mediterranean countries well before the Christian period began, but the breed is an ancient dog with documented evidence going back to the third century A.D. The dog we know today was developed in Great Britain. They were originally bred to follow a blood scent from wounded deer, wolves and other large animals. As the deer population began to decrease, hunters turned their attention to fox and the Bloodhound was replaced with the much faster Foxhound. That’s when the Bloodhound’s expertise was repurposed to tracking down poachers, criminals and people who were lost. Bloodhounds are gentle and friendly dogs. They were never bred to be aggressive, and selective breeding has always been focused on creating a dog to simply find people without harming them. Because the breed can be headstrong at times, you might need some extra CANIDAE treats when training him. However, the Bloodhound’s laidback nature is well suited as a family pet if he has a consistent and confident owner who uses positive reinforcement training. Harsh treatment will backfire with this sensitive dog. On an interesting side note, Bloodhound does not refer to what a Bloodhound trails – it refers to the lengths early monastery and aristocratic breeders took in recording their ancestry, bloodlines, to keep the status of this “Blooded Hound” pure. A digital magazine focused on the death investigation community. 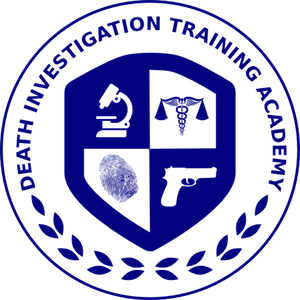 Dedicated to improving skills and enriching lives of investigators. This kit is equipped to collect fragile evidence such as DNA and fibers, take post-mortem temperatures, document the scene through photography and sketching, as well as properly collect transport, and store material evidence. Most Native American tribes believed that the souls of the dead passed into a spirit world and became part of the spiritual forces that influenced every aspect of their lives. Many tribes believed in two souls: one that died when the body died and one that might wander on and eventually die. Burial customs varied widely from tribe to tribe. Indians disposed of their dead in a variety of ways. Arctic tribes, for example, simply left their dead on the frozen ground for wild animals to devour. The ancient mound-building Hopewell societies of the Upper Midwest, by contrast, placed the dead in lavishly furnished tombs. Southeastern tribes practiced secondary bone burial. They dug up their corpses, cleansed the bones, and then reburied them. The Northeast Iroquois, before they formed the Five Nations Confederation in the seventeenth century, saved skeletons of the deceased for a final mass burial that included furs and ornaments for the dead spirits’ use in the afterlife. Northwest coastal tribes put their dead in mortuary cabins or canoes fastened to poles. Further south, California tribes practiced cremation. In western mountain areas tribes often deposited their dead in caves or fissures in the rocks. Nomadic tribes in the Great Plains region either buried their dead, if the ground was soft, or left them on tree platforms or on scaffolds. Central and South Atlantic tribes embalmed and mummified their dead. But during outbreaks of smallpox or other diseases leading to the sudden deaths of many tribe members, survivors hurriedly cast the corpses into a mass grave or threw them into a river. 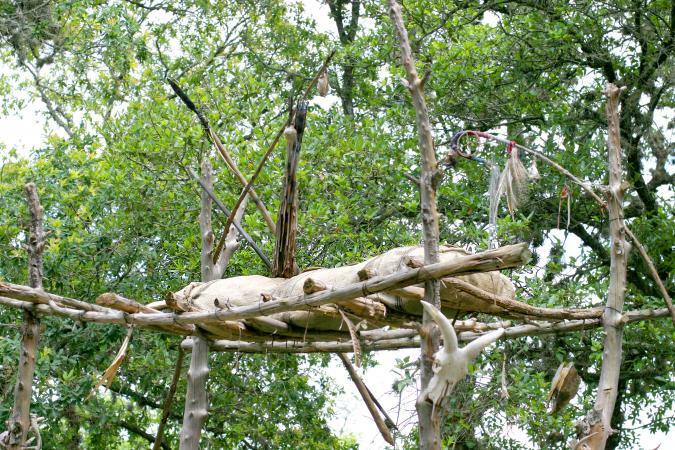 Rites among Native Americans tended to focus on aiding the deceased in their afterlife. Some tribes left food and possessions of the dead person in or near the gravesite. Other groups, such as the Nez Perce of the Northwest, sacrificed wives, slaves, and a favorite horse of a dead warrior. Among many tribes, mourners, especially widows, cut their hair. Some Native Americans discarded personal ornaments or blacked their faces to honor the dead. Others gashed their arms and legs to express their grief. California tribes engaged in wailing staged long funeral ceremonies and held an anniversary mourning ritual after one or two years. Southwest Hopi wailed on the day of the death and cried a year later. Some Southwestern tribes, especially the Apache and Navajo, feared the ghosts of the deceased who were believed to resent the living. The nomadic Apache buried corpses swiftly and burned the deceased’s house and possessions. The mourning family purified itself ritually and moved to a new place to escape their dead family member’s ghost. The Navajo also buried their dead quickly with little ceremony. Navajos exposed to a corpse had to undergo a long and costly ritual purification treatment. Among the honored officials of the Choctaws were men – and possibly women – who were known as bonepickers. These undertakers were tattooed in a distinctive manner and allowed their fingernails to grow long for their revolting occupation. When the body had remained upon the scaffold the specified time, a bone-picker was summoned, and all the relatives and friends were invited for the last rites. These mourners surrounded the scaffold, wailing and weeping, while the grisly undertaker ascended the platform, and with his long fingernails thoroughly cleaned the bones of the putrefied flesh. The bones were then passed down to the waiting relatives, the skull was painted with vermilion, and they were carefully placed in a coffin curiously constructed of such materials as bark and cane. The flesh was left on the platform, which was set on fire; or was carried away and buried. Johnathan holds a Bachelor’s degree in Psychology and has been researching Native American mortuary customs for three years. He is an old soul and generally prefers the company of animals. His unique visionary approach to the subject allows insightful understanding of history and anthropology. Coroner Recognition Week January 27th – February 2nd with the focus day being January 29th. The first American Coroner was Thomas Baldridge of St. Mary’s, Maryland Colony appointed on 29 January 1637. 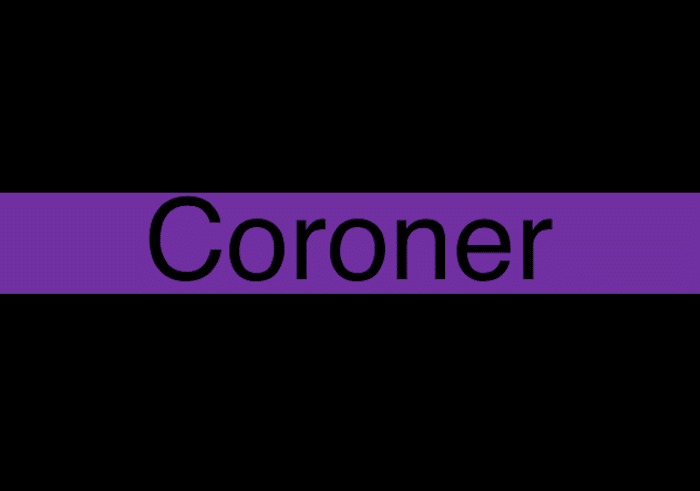 The National Coroner Recognition week and the thin line color purple is a project focused on bringing awareness to the job of a Coroner and the need for better funding and training in the further development of the field. 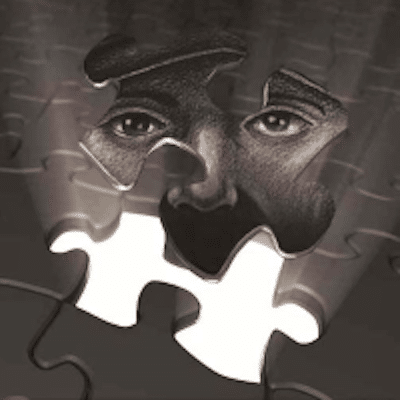 Dealing with the worst that death has to offer several times a month can take a toll on anyone and those working in the Coroner and MDI fields of investigation knows first-hand how mentally draining it can be. Often forgotten about or dismissed, the role and function of a Coroner or Medicolegal Death Investigation is vital in our criminal justice system as well as in identifying trends in causes of death and possible disease outbreaks. A coroner is a public official, appointed or elected, in a particular geographic jurisdiction, whose official duty is to make inquiry into deaths in certain categories. The office of the coroner (or “crowner”) dates back to medieval times in England when the crowner was responsible for looking into deaths to be sure death duties were paid to the king. The coroner’s primary duty in contemporary times is to make inquiry into the death and complete the certificate of death. The coroner assigns a cause and manner of death and lists them on the certificate of death. The cause of death refers to the disease, injury, or poison that caused the death. The coroner also decides if death occurred under natural circumstances or was due to accident, homicide, suicide, or undetermined means or circumstances. The can be found at www.lastresponder.org Learn more about the National Recognition week and buy swag to show your support for Coroners and MDI’s everywhere. Serial killers hold the fascination of the public, whether in true crime news accounts of individuals such as Ted Bundy or fictional depictions such as the television shows Dexter and Criminal Minds or popular movies such as the “Girl with the Dragon Tattoo” or “Silence of the Lambs.” Serial killers seem so purely predatory and unremorseful that our society cannot help but display a macabre interest in them. Although they account for no more than 1% of the approximately 15,000 homicides in the U.S. annually, serial killers receive a disproportionate amount of media attention due to the incomprehensible savagery of their deeds. Significantly, serial killers differ from mass murderers or spree murderers. Mass murder can be defined as the killing of multiple people at a single location where the victims may be either randomly selected or targeted. 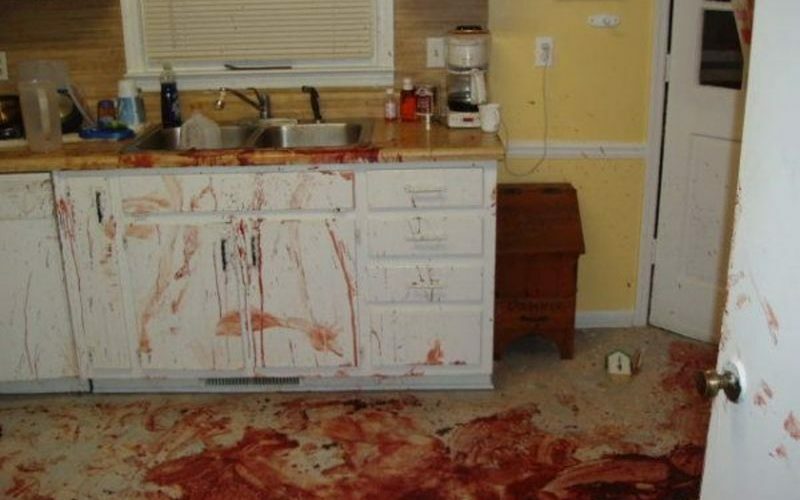 A mass murderer is often killed at the scene of the crime; sometimes by his/her own hand. A spree murder is the killing of multiple people at different locations over a short period of time (the maximum duration is usually 7 days). The killer in spree murders often but not always knows his/her victims, and most often targets family members or romantic partners. 1. At least three murdered victims. 2. The murders take place in separate events, at different times. 3. The killer experiences an emotional cooling off period between murders. The key distinction between serial killers and mass or spree killers is this emotional cooling off period in which the killer blends back into his/her seemingly normal life. The predator reemerges to strike again when the urge to kill becomes overwhelming. The duration of the cooling off period can vary from weeks to months or even years, and varies by a killer. Dennis Rader or “Bind, Torture, Kill” (BTK) had 10 known victims over nearly 30 years! There is some disagreement over the serial killer definition, mostly about the number of killings required. There is also debate as to whether organized crime hit-men should be considered serial killers. Doc Bonn argues that they are not serial killers because their motivation is purely business and their killings fulfill no emotional needs. Serial killers are driven to murder by urges and fantasies that they frequently do not comprehend. What are the roles of the popular media, state officials and the killers themselves in the social construction of serial killers’ public identities? Why are so many people fascinated with serial killers? What social-psychological needs do serial killers fulfill for the public? In order to help answer these questions, Doc Bonn is exploring the mysterious, psychopathic criminal minds of infamous serial killers. Ironically, and perhaps shockingly, this book proposes that serial killers may actually serve a function in society by clarifying the meaning of “evil” and setting moral boundaries—that is, by helping to establish the outer limits of what one human being can do to others. Doc Bonn believes that it is quite natural for people to be fascinated by why serial killers commit their murders and for their grizzly exploits to become media spectacles. Let us know what you think about this topic. Dr. Scott Bonn (“Doc Bonn”) is Professor of Criminology, media expert and analyst, public speaker and author. He is an expert on criminal behavior and the motivations of criminals. He offers insights into various types of crime, including white-collar, state crime, bullying, domestic violence, sexual assault and serial homicide. His expert commentary frequently appears in the popular news media. Doc Bonn is the author of “Mass Deception: Moral Panic and the U.S. War on Iraq,” a critically acclaimed book on war crime and terrorism from Rutgers University Press (2010). His latest book is on the public’s fascination with serial killers in which he offers insights into the minds of infamous predators and explains how and why serial killers are often transformed into ghoulish popular culture celebrities by the media. Titled “Why We Love Serial Killers” the book is published by Skyhorse Press and released in October 2014. Professor Bonn is not your average academic. He combines the knowledge and skills of an academic scholar with more than twenty years of senior-level corporate experience in advertising and news and entertainment media. 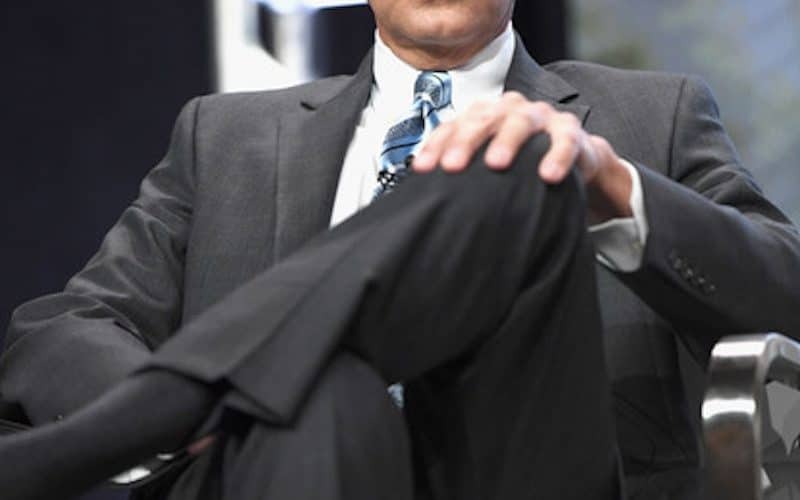 As such, he has unique insights into the public’s attitudes and beliefs, how they are shaped, and the agenda-setting powers of political leaders and the news media. Doc Bonn has developed a unique, integrated, and interdisciplinary theory called “critical communication” to explain how state officials and the news media actually shape public opinion on complex issues such as homicide, capital punishment, drugs, abortion and terrorism. Doc Bonn received a doctorate in sociology (criminology) at the University of Miami, FL, and a masters degree in criminal justice administration at San Jose State University. He teaches courses in criminology, sociology of deviance, media and crime, and criminal justice. His primary research interests include white-collar crime, state crime, domestic violence, serial homicide and how the media influence society. 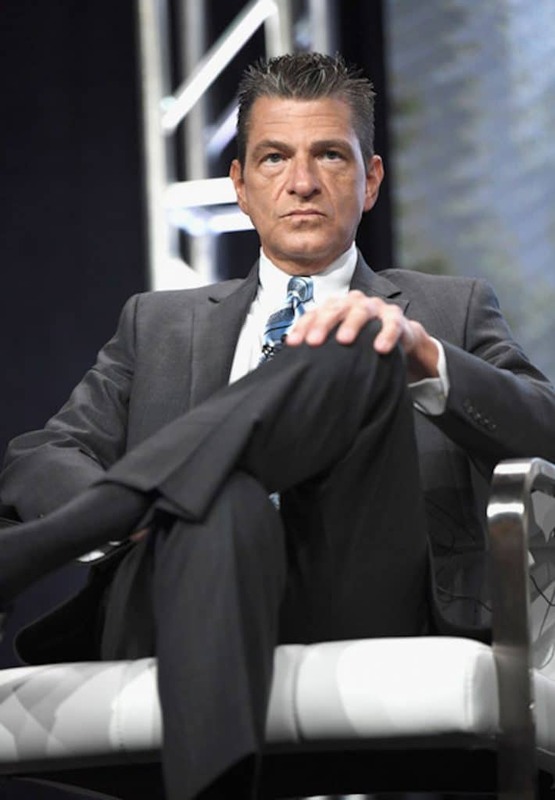 Prior to his academic career, Bonn held high-ranking corporate positions such as Vice President at NBC Television Network, and Executive Vice President at SonicNet, a leading music website, now a part of MTV Networks. He resides in Manhattan, New York. Charles Lundquist is chaplain at Bedford Hills Correctional Facility for Women in Westchester County, New York, located forty-five miles northwest of Manhattan. He is also a serial killer who preys on teenage girls. 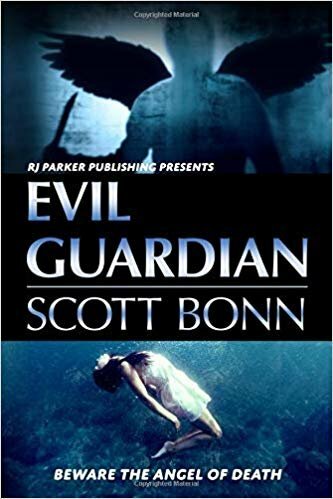 Lundquist is a cold-blooded psychopath who calls his murderous alter ego the guardian because he believes that he is serving God and protecting innocent females from evil by killing them. Ironically, he loves to kill and his lust for blood is insatiable. When New York Police Commissioner Bill Bratton realizes that a serial killer is on the loose in Manhattan, he assigns homicide captain James Pritchard to lead the manhunt. Pritchard is a talented but troubled detective who is dealing with the deaths of his wife and teenage daughter killed by a drunken driver. The hunt for the guardian quickly becomes a personal obsession for Pritchard. Joining him in his quest to find the guardian is a brilliant and attractive FBI special agent named Julia Cassidy. Cassidy, too, becomes obsessed with stopping the guardian, and she and Pritchard quickly form a powerful, intimate bond. By the time that the guardian has claimed his fifth victim, the city of New York is in a state of complete panic. Making matters worse, the killer is taunting James Pritchard in letters he sends to the news media; daring the homicide captain to catch him. Pritchard and Cassidy become desperate in their investigation due to the absence of leads. They soon recognize that they are facing an adversary unlike any other they have ever encountered. The guardian is cunning, meticulous, arrogant, compulsive, unremorseful, and he will never stop killing. 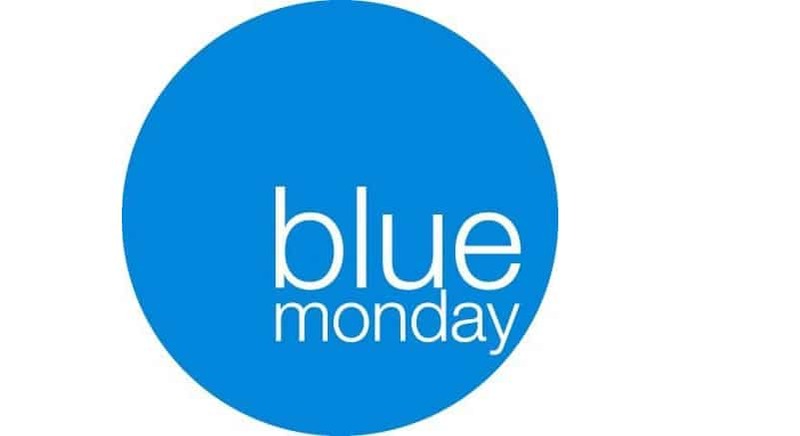 A few years ago, the third Monday in January was labeled Blue Monday by many experts in the mental health field. 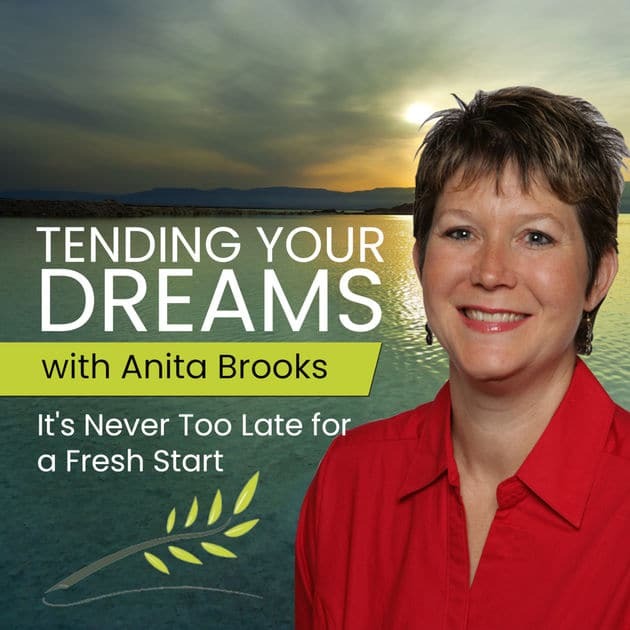 But no matter what day of the week it occurs on, Anita Agers-Brooks, common trauma expert, and author of Getting Through What You Can’t Get Over, believes January 21st is a good barometer to predict the most depressing day of the year. If it takes twenty-one days for a mindset to change, earmarking January 21st as the most depressing day of the year may just make sense. According to Brooks, based on several pieces of research she’s studied, as well as based on extensive interviews she’s conducted with everyday people, there are several contributors that solely, or linked with others, can throw even the hardiest soul into the pit of depression on or around this date. So how do you personally off-set some of these melancholy contributors? When it comes to post-holiday blues, there are a few simple tips that can help. Intentionally focus your thoughts on something challenging, fresh and positive — a different kind of activity from anything you currently do. Take up a new hobby. It can be something you’ve always wanted to try, but choose something that requires concentrated effort. The human mind cannot think two distinctly different thoughts simultaneously, so for those used to the analytical world of left-brain work, try a creative right-brain project, like taking up drawing, painting, writing, or learning a musical instrument. If none of those sound appealing, take up a new kind of physical activity, different from anything you’ve tried in the past. Pick a change of pace in the martial arts, kick-boxing, training for a 5K or half-marathon, or if your spouse is willing, really think outside the box and rev up your marriage at the same time by taking up dancing lessons. Swing, ballroom, waltz, latino, whatever pushes you out of your comfort area, and requires your full attention. When sadness lingers long after your loved ones’ holiday visit is over, begin planning your next get-together. It’s been proven that anticipation is as good or better than an actual event. If you aren’t necessarily sad over missing a person, but boredom and the blahs are your nemeses, plan once-a-month mini-vacations or weekend getaways. Your destinations don’t have to be extravagant or costly, you can even transform your home into a tropical fantasy island for a couple of days. Just choose something you can outline to give you a positive event to work toward, and allow your mind to look forward to the big date. If holiday bills are stressing you out, take thirty minutes to an hour, and create a budget that you write on paper or a computer. By putting things in black and white, you’ll give yourself a true perspective. Often, a situation feels more overwhelming when we aren’t clear on the details. What we fear is often much worse than the facts. Cabin fever is a real malady. If you are beginning to feel cooped up, even though you’re getting out to do your job, take a mental break and get away for a day. Go someplace out of the ordinary, like a museum, science center, indoor sporting event, or even a long walk in a wooded area — especially if you can do it after a fresh, white snow. Nature has proven herself a powerful healing agent, increasing the benefits of physical exercise tremendously when we do it in a peaceful outside climate. Breathe in fresh air, and breathe in a fresh spirit. When it’s cold outside, heat yourself up by giving special treatment to your toes. Soak your feet in a warm Epsom salt bath. The magnesium and other minerals in Epsom salt have many healing properties, including natural anti-depressant chemicals, and when you warm your feet in water, you get an inside and outside boost of healing heat. Have your doctor check your Vitamin D levels to see if you need supplements to get you up to par. One of the reasons many people suffer from higher degrees of depression in the winter is due to less sun exposure, which offers natural infusions of Vitamin D, a known depression-buffering vitamin. One of the best preventative medicines for colds and flu also happen to be powerful anti-depressants. Citrus fruits and vegetables. Oranges, lemon, lime, grapefruit, kiwi, pomegranate, tomato, green peppers, green chile, or any other natural fruit or veggie that’s high in Vitamin C can help you kick a cold to the curb, as well as lift your mood. If you can’t exercise outside, don’t have a treadmill or other home equipment, can’t get to the gym, or can’t devote 20-60 minutes to an exercise regimen then do one-minute intervals when and where you can. Sixty seconds of jumping jacks, running in place, skipping an invisible rope, dancing, kicking, air boxing, or anything else that gets your limbs moving will work. If you do 20 intervals in a day, you’ve gotten twenty minutes of exercise in. Surround yourself with some color, the ones known to soothe and energize. Green, blue, yellow, will calm and lower blood pressure, while red, pink, and orange will elevate your energy. Change your computer screensaver, your telephone background, carry a photo or drawing, anything that lends to an uplifted spirit will work. Try to view at least once an hour to reframe your brain through the psychology of color. When you feel like avoiding everyone is precisely when you might need to be around people the most. Withdrawal from human interaction is a symptom of depression. If the black clouds of overwhelming emotions are causing you to pull back from other people, do what feels uncomfortable, make yourself do something social with others. Studies have shown that anxious or depressed people, those battling PTSD or other trauma-induced issues, assume that having conversations with others will make them feel worse when in actuality, the opposite is true. Those surveyed said they were surprised to discover that their fear of having a face-to-face interaction was unfounded, they actually felt better once it occurred. Anita stopped making New Year resolutions several years ago. Instead, she began to incorporate a One Word focus into her annual commitment to making a fresh start. This year, her One Word is Rise. This gives her a lens with which to look at her life through. She knows this word will help her rise above circumstances, but it is also a great word for application to the list of things that can lead to the most depressing day of the year. Anita said, “I can rise above my emotions, and act on what I can while accepting what I cannot change. Think the Serenity Prayer. For those in the field working death investigations, what One Word could keep you motivated throughout the year? What word could inspire and energize you? Is there a One Word focus you can add this year, infusing you with a compass to move you away from depression and toward a happier outcome? Is there a word that will keep you focused on purpose, gratitude, productivity, or meeting your goals. When you review the list of areas that can lead to depression, ask yourself, what decisions can I make that will enable me to rise above my circumstances? Can I tweak something in my life to make me proactive versus reactive? We may not be able to change the factors that lead to depression, but we can certainly move our minds up. Investigating what’s going on in our own brains and bodies can give us the boost we need — and help us get through, no matter what challenges we face. Intentionality in the areas of our bodies, minds, and spirits can help us smile, even on the most depressing day of the year. 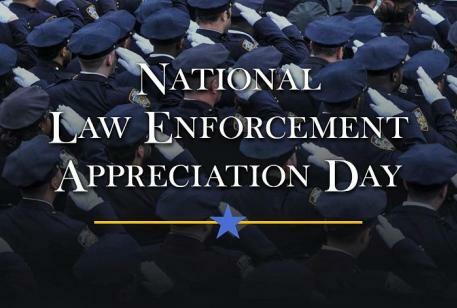 There are over 900,000 law enforcement officers in the United States, and they are honored on National Law Enforcement Appreciation Day (L.E.A.D. ), being shown that the community recognizes the difficulty of their job and supports them as they provide a public service. The day is dedicated to all members of law enforcement, but the focus is on police and similar state and local agencies. It was started by Concerns of Police Survivors (C.O.P.S), which partners with organizations across the country to make the day happen. First observed in 2015, National Law Enforcement Appreciation Day came about in the wake of the 2014 Ferguson, Missouri, officer-involved shooting of Michael Brown, at a time when there was much scrutinization of police officers and concerns about police brutality. Observants of the day spend it thanking police officers, wearing blue, and turning on blue lights at their homes. Having a police force is a relatively new concept in the scope of history. During colonial times, forces were part-time and privately funded. Volunteer night watches were also common. Boston started one in 1636, followed by New York City in 1658 and Philadelphia in 1700. These were not very efficient, and those who were put on duty were often put there for punishment. When cities grew larger, night watches were even more ineffective. The first full-time, publicly funded police force in the country was formed in Boston in 1838. Boston was a large shipping area and the need for policing grew out of the need to protect shipping. Merchants had long hired officers to watch over their goods, and then found a way to pass off the costs to the public by convincing them it was for the common good. In the south, slavery was the original driving force behind the creation of police forces. Beginning in the early eighteenth century, officers chased down runaway slaves and prevented slave revolts. Following Reconstruction, many local sheriffs did similar work to that of the earlier patrols, by enforcing segregation and the disenfranchisement of freed slaves. By the late 1880s, all major cities had police forces. Officers were there to protect public order, which meant different things to different people. Businessmen with connections to politicians did not want disruptions to their workforce from labor-union organizers and immigrants. Political machines were also rampant at the time, and heads of police were picked by political bosses. It was not until well into the twentieth century that there was a move towards the professionalization of police officers. National Law Enforcement Appreciation Day, also known as L.E.A.D., is observed next on Wednesday, January 9th, 2019. It has been observed annually on January 9th since 2015. In this episode, I discuss the ending of the Coroner Talk Podcast and the decisions we made going forward. After 4 years and 500 thousand downloads in over 140 countries, it was time to retire this work and move efforts somewhere else. A Postmortem Reconstruction is developed by reconstructing facial characteristics of an unidentified deceased person with decomposed or damaged human tissue. The image will first show trauma to the victim and is repaired digitally or by applying paints directly to the photograph, covering the injured area making the features recognizable. The drawing repairs the trauma to the victim so that the final image will be more presentable when asking for law enforcement or the public’s assistance in identification. The final reconstruction is used as an investigative aid for identification and can help to expedite an investigation to lead to the discovery of the unknown. SketchCop® FACETTE Face Design System Software is arguably the first facial composite software capable of yielding the same quality product offered by that of a police sketch artist. It is designed to help produce a consistent end-product to assist in the reduction of investigative cycle times. 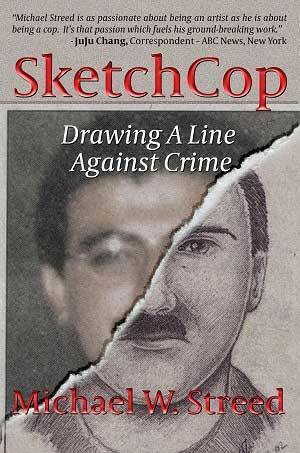 SketchCop® FACETTE is portable and easy to use. Our database is populated with sketched facial components. This is especially helpful for non-artists who want to create high-quality facial composites. Our Adobe® licensed editing tools allow users to fine-tune their composite images to make the same subtle changes a police artist would using a pencil and eraser. Those who want to increase eyewitness satisfaction can use our latest version of SketchCop® FACETTE to import their composite images into Adobe® Photoshop® to further refine their images. With SketchCop® FACETTE, users can focus on the most important part of creating any facial composite – the eyewitness interview. Sergeant (Ret.) 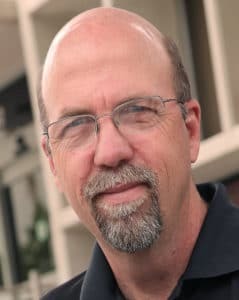 Michael W. Streed is an internationally-recognized forensic facial imaging expert providing facial identification services to America’s largest police agencies. Many investigators are unaware of the extreme risks that are present when dealing with blood and bodily fluids. There are many bloodborne pathogens (BBP) infections that can be transmitted through contact with another person’s blood or bodily fluid that may contain blood including but not limited to, Hepatitis B, Hepatitis C and HIV. Most exposures are caused by a lack of universal precautions on some level, whether they are the result of failure to use proper personal protective equipment (PPE) or are due to an unintentional sharp left in an inappropriate container for disposal. 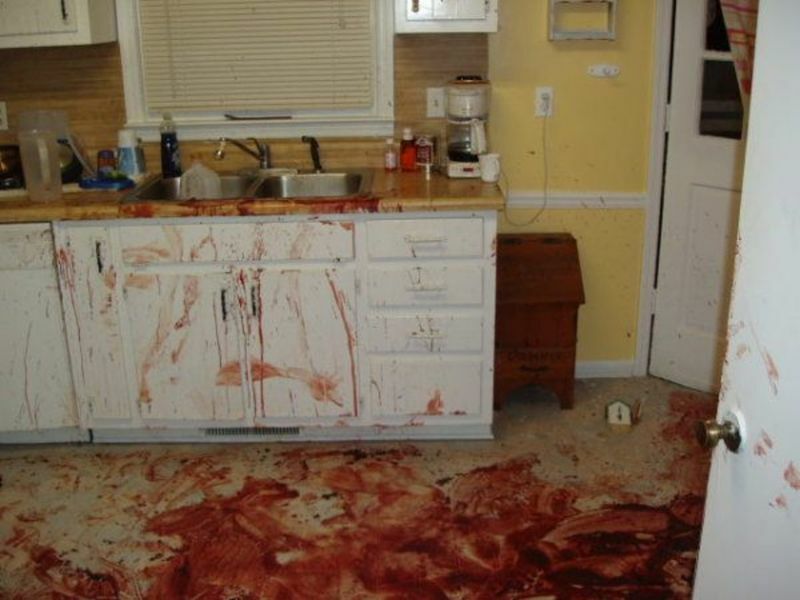 Once you look at some crime scene bio-hazards statistics you will have a new respect of crime scene protection. The caution here is; don’t let the day to day work desensitize you from the real dangers of blood and body fluids. 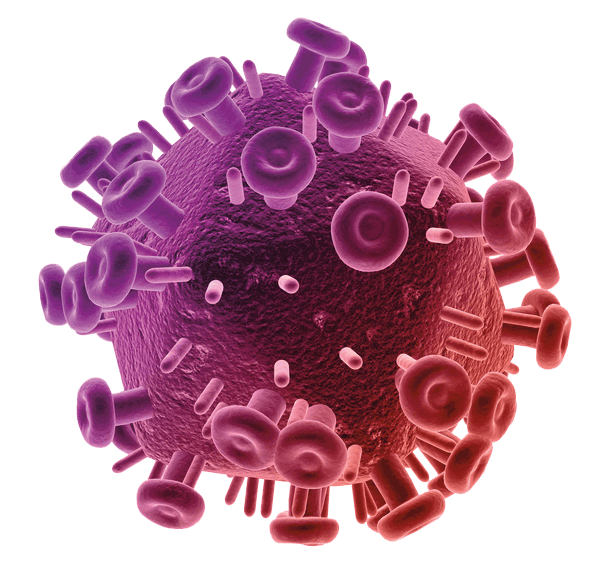 1 out of every 24 people has Hepatitis B, Hepatitis C or HIV. 1 in every 26 people has Hepatitis B. 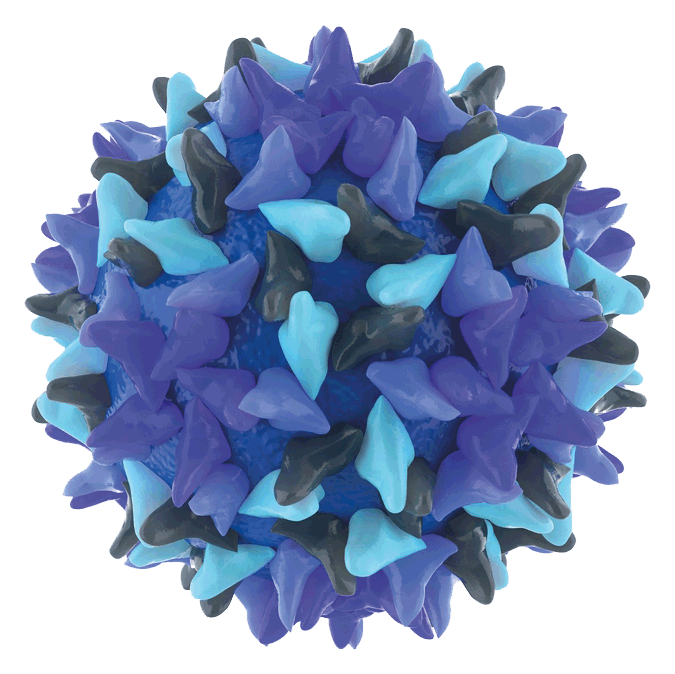 Approximately 12 million Americans have been infected with Hepatitis B. Over 1.4 million are chronically infected. 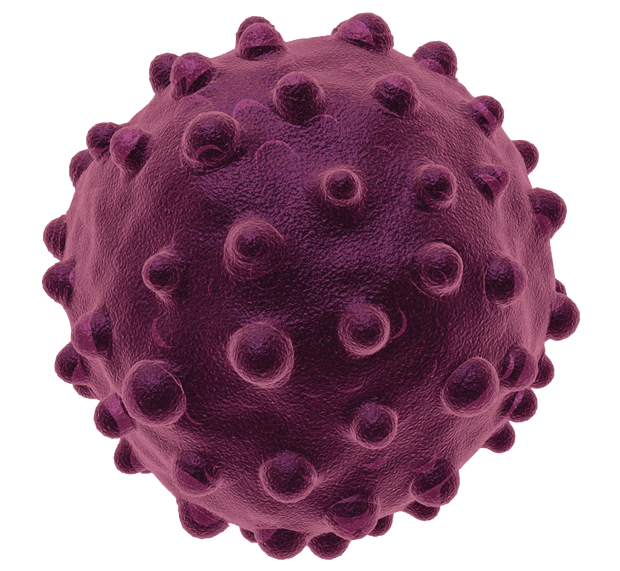 About 50% of the people in the United States with Hepatitis B are unaware of their infection. Up to 100,000 new people will be infected each year. Approximately 5,000 people will die each year from Hepatitis B and its’ complications. Hepatitis B is 100 times more infectious than the AIDS virus. 1 in every 77 people has Hepatitis C.
Approximately 3.2 million people in the United States have Hepatitis C.
Over 75% of the people in the United States with Hepatitis C are unaware of their infection. Hepatitis C is the most common bloodborne pathogen infection in the US. Hepatitis C is the most common cause of death from liver disease. 1 out of every 258 people has HIV. There are an estimated 1.1 million people living with HIV in the United States. 1 out of 5 are unaware of their infection. There are 50,000 new HIV diagnoses every year. Every 9.5 minutes someone in the United States is infected with HIV. 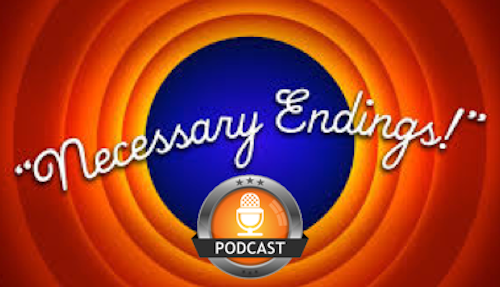 I this episode I share the conversation I had on the podcast Tending Your Dreams. The host draws out background information not regularly shared on this show. We also talk about the development of the Academy and the book CODE. This is an interesting episode because it gives a good behind the scenes look at this show and the Academy. Find the Tending Your Dreams Podcast on Apple Podcast or your favorite podcast directory.